ShukerNature: LOOK OUT FOR THE INVISIBLE CATFISH! 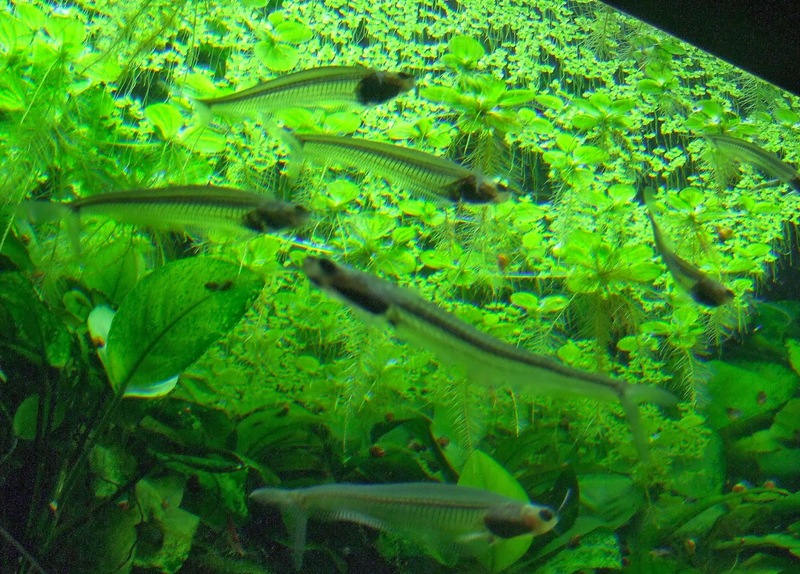 There are several species of fish familiar to the tropical freshwater aquarist that are virtually transparent. These include the x-ray fish Pristella maxillaris (a species of tetra), the glass catfish Kryptopterus bicirrhis, and the ghost catfish K. minor. But what about an entirely transparent, invisible fish? By definition, no-one has ever seen such a creature, because if they have done, it can't have been invisible – or can it? During my cryptozoological researches, I uncovered a very intriguing account of an allegedly invisible species of catfish, encountered and reported first-hand by a well known zoologist. As will be revealed here, however, upon further investigation it turned out to be something far removed indeed from its original description. "Do you know anything about a new species of fish that can make itself invisible? Discovered near coral reefs off the Seychelles in the Indian Ocean this mysterious creature turns from black to grey before ‘vanishing’! Apparently a pair sell for £15,000." I had certainly never heard of it before, but knowing Gerald well, I had no doubt that this was a serious request on his part, not a joke; if he was asking me for information concerning such a fish, then he definitely believed that it existed. So I promised him that I'd look into it, and get back to him with any news that I may find. Tragically, however, this was not to be, because only a short time later Gerald died suddenly. And despite my efforts, I never did succeed in adding any details to those scant ones supplied by him. Of course, this episode took place several years before the internet became an unrivalled source of instantly-accessible information. More recently, therefore, after recalling Gerald's invisible mystery fish and re-reading his letter referring to it, I pursued it again, but this time online, to see if anyone else had ever reported such a remarkable creature. Sadly, however, I still failed to elicit any information concerning it, but during my internet researches I did learn about what sounded like a bona fide invisible catfish, indigenous to a specific freshwater cave pool on the West Indian island of Trinidad. My source of information was a passage of text from a book entitled Caribbean Treasure, first published in 1939 (many thanks to correspondent Cameron A. McCormick for kindly providing me with a copy of the relevant passage). 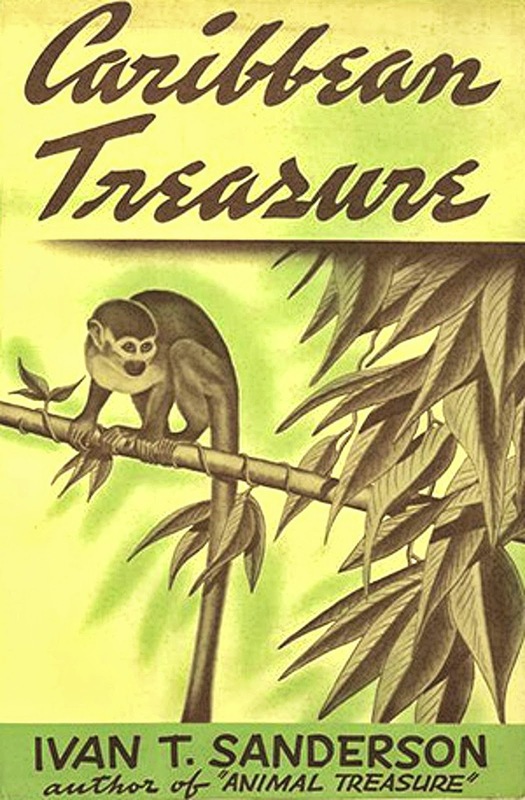 It was written by Ivan T. Sanderson (1911-1973) - a Scottish-born American zoologist who was also an animal collector, zoo founder, prolific nature-travel writer, and notable television personality in the States (in many ways, therefore, a direct counterpart to Britain's own Gerald Durrell). As related by Sanderson in his book, he had been conducting a field trip to Trinidad's Northern Range when he was informed by his local guides that a certain pool at the foot of the first vertical drop of Oropuche (aka Cumaca) Cave was the only known habitat of a rare, unique species of catfish that was so colourless and transparent that it could only be detected by observing its shadow passing across the bottom of the pool. Sanderson identified this elusive species as 'Caecorhandia urcihi' [sic – should be Caecorhamdia urichi], and stated that it was totally blind. Due to its invisible nature, no specimen of this catfish was captured by Sanderson or his helpers, even when using a torch beam in the hope of illuminating it somehow. That, at least, was Sanderson's claim concerning this species. The reality, however, as I discovered when seeking out more information regarding it, is very different indeed. It was first brought to scientific attention in July 1924, when Trinidad-born naturalist Friederick W. Urich sent a specimen to London's Natural History Museum. After studying it, in October 1926 museum ichthyologist John R. Norman formally described and named its species Caecorhamdia urichi, in honour of Urich. During the mid-1950s, six additional specimens were collected in its cave pool by Prof. Julian S. Kenny, the foremost expert on Trinidadian freshwater fishes at that time. After studying them in aquaria maintained at his home, Prof. Kenny concluded that they did not constitute a valid species in its own right but were merely a cave-dwelling (troglobite) variety of Rhamdia quelen – a species of three-barbelled catfish common in rivers throughout Trinidad. Moreover, these six specimens varied greatly in colour, from dark grey-charcoal to pale pinkish-white. Yet all were readily visible, being quite thick in shape (as opposed to the extremely thin, flattened shape that one would expect for a reputedly transparent fish), and had therefore been easily captured. And whereas the pale specimens were indeed eyeless, the darker ones possessed small but well-formed eyes. Clearly, therefore, Sanderson's description of this catfish form was incorrect on a number of crucial counts. In addition, I remain baffled at how anything supposedly invisible by being totally transparent is able to cast a shadow anyway. In April 1966, the plot thickened even further, when Dr G.F. Mees, a catfish expert from the Netherlands, tried to catch some specimens in their cave pool. In contrast to Kenny's experience, they proved very difficult to capture, and when he finally did procure three specimens, Dr Mees was surprised to discover that two of these were normal-coloured eyed specimens of R. quelen, and the third, although eyeless, was also normal-coloured. In October 2000, Dr Aldemaro Romero and Joel E. Creswell published a short article in National Speleological Society News concerning this fish and their January 2000 visit to its pool, where they observed dozens of specimens. Not one of them, however, was eyeless or of pale, depigmented colouration. On the contrary, their eyes each uniquely appeared to possess a tapetum lucidum, making them flash when illuminated by torchlight. Romero and Creswell concluded that although there may well have originally been pale, eyeless specimens here, they were probably rendered extinct following an influx of normal-coloured eyed specimens from a stream that had invaded their cave. There is a notable precedent for this hypothesis. A population of the Mexican cave tetra Astyanax mexicanus was documented in 1983 that had originally consisted of pale eyeless specimens, but these had been wiped out in under 50 years following an influx of normal-coloured eyed specimens from a river close by. Today, C. urichi is treated merely as a synonym of R. quelen, and the allegedly invisible nature of its former representatives as claimed by Sanderson (in what was ultimately dismissed by critics as an exercise in 'creative description') has been wholly disproved. A sad but perhaps fitting conclusion to this remarkable case – an invisible catfish that was not invisible at all in real terms, but was finally rendered so via taxonomy. DON'T OVERLOOK THE BRAZILIAN INVISIBLE FISH! No coverage of invisible fishes could be complete without mentioning the infamous Brazilian invisible fish. Once a staple exhibit at any travelling sideshow or display of curiosities, it was generally housed within a large water-filled goldfish bowl, and the viewing public were invited to peer closely at the bowl in case they could discern this highly elusive and rare species. Some observers couldn't spy it, which is not really surprising, because there was nothing whatsoever in the bowl except for the water! 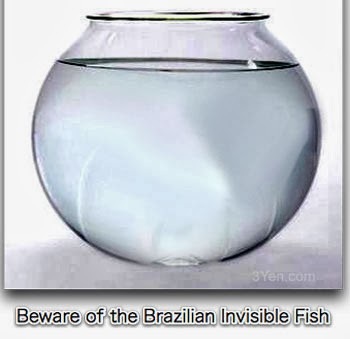 The Brazilian invisible fish was, of course, a hoax. It first attracted notable attention when Harry Reichenbach (1882-1931), an American publicist, used this scam in order to attract potential customers to a poor woman's restaurant, by placing the bowl and a big sign advertising it in the store's window. Amazingly, however, there would always be those who were adamant that they had definitely seen something move inside the bowl - and sometimes that was actually true. This was because Reichenbach would strategically place a small electric fan out of sight but near enough to the bowl to create a faintly visible ripple passing through the water). All of which goes to prove that just as there are none so blind as those who do not want to see, equally there are none so perceptive as those who do want to see. A noteworthy cryptozoological caveat? This ShukerNature article is excerpted exclusively from my forthcoming book The Menagerie of Marvels: A Third Compendium of Extraordinary Animals, to be published later this year by CFZ Press.